Three premium sites in the tightly held suburb of Springvale are set to hit the market amidst predictions of interest from developers, owner-occupiers and investors alike. Colliers International’s Jeremy Gruzewski and David Kalb, in conjunction with Andrew Dawkins and Walter Occhiuto of Dawkins Occhiuto, have been appointed to sell three properties. “These properties offer developers, owner occupiers and investors three unique opportunities in one of Melbourne’s most sought after commercial/industrial locations,” Mr Gruzewski said. “The surrounding area provides a mixture of commercial, industrial and retail development, and is enhanced by the recent developments of Bunnings and the Springvale Homemaker Centre. The properties are prominently located in Springvale, approximately 20 kilometres southeast of the Melbourne CBD, featuring expansive exposure to both Princes Highway and Centre Road. The sites, which have a combined area of 21,165.5 square metres, can be purchased as a whole or individually. Mr Gruzewski said the properties were likely to attract interest from a variety of buyer groups due to their flexibility and range of future potential uses. “These sites could be retained, providing long term holding income from multiple tenants with a current net income estimated at approximately $254,209 per annum,” he said. According to Mr Gruzewski there is also potential for a future development to consist of a mix of both high profile showrooms and an office/warehouse development utilising both street frontages. “Given the unique nature of the site – including its size, flexibility and exposure – it will also appeal to major owner-occupiers, both corporate and national,” he said. 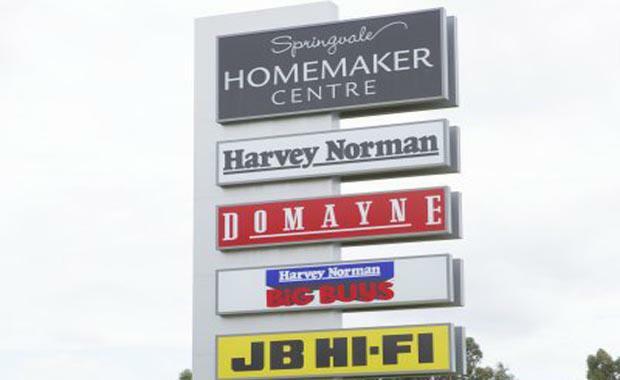 Mr Dawkins said the sites were strategically located between Bunnings and the Springvale Homemaker Centre, including IKEA, with the area supported by an established and expanding residential base. “New major residential developments taking place on the former Sigma Pharmaceutical site, Centre Road, Clayton and the former Canterbury Windows site on the corner of Westall Road and Osborne Avenue, Springvale are two examples of the expanding catchment,” he said.